The AFrame Menu Bar provides pull down menus to quickly access system functions, page and field help, and other control features. Users may access the Menu Bar with the mouse or through keyboard shortcuts. AFrame provides a set of navigational tools to guide users in the use of the application framework. They are graphical and fully integrated. AFrame provides standard keyboard shortcuts that allows continued finger placement on the keyboard. Keyboard shortcuts utilize the Function keys F1 - F12, and key combinations using the Alt, Ctrl, and Shift keys, such as F4 to display the Function List. 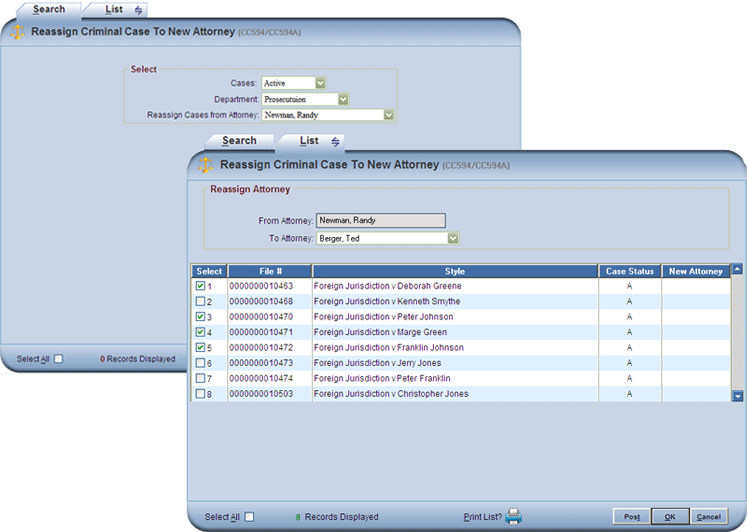 In AFrame, units of work are organized into functions that are identified by unique Function Names, such as Criminal Case New, and Function IDs, such as CC650. 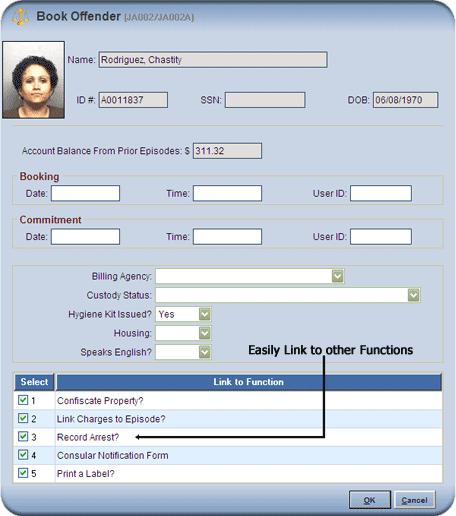 When a user logs onto the system, the user's Function List is automatically displayed. It consists of a Windows-Explorer-like tree view of the function names to which the specific user has been given access. For most users, only functions needed to perform daily work tasks will appear on the Function List. Function names are organized on the Function List in the order designated by the Systems Administrator. Function names may appear individually or grouped into logical folders. 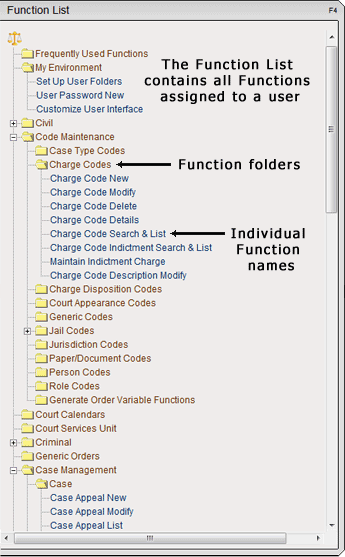 Additionally, an individual user's most commonly used functions may be grouped into a Frequently Used Functions folder at the top of the list. A specific function is invoked by clicking the function name or by entering the Function ID in the Fast Path entry box at the top of the Function List. If the user hovers over a function name with the mouse, the function name will highlight and the ID will display as a tool tip. The Function List is the core navigational aid used in AFrame. There are currently more than 1500 functions used in AFrame, all of which are fully customizable. Data queries are accomplished using Search & List tab pages that allow users to enter search criteria on one tab page and receive a list of matching results on the other. The user can "tab" back and forth between search and list components. Users may select one or multiple records from the list page to perform additional processing. The GoTo List utilizes saved key values, and provides a quick and easy means to jump to associated functions of the current function. 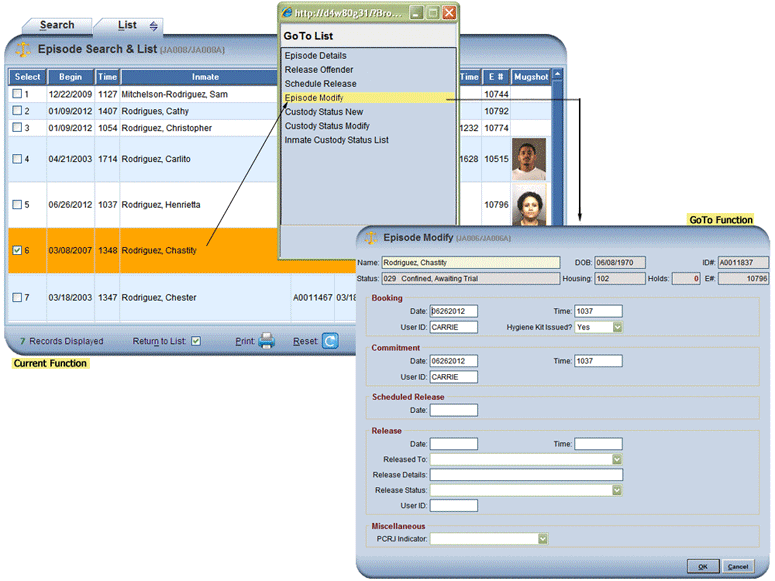 The user can perform multiple, related functions on a single record or a set of records. Link Lists are similar to the GoTo List in that they provide immediate linkage to functions that are usually, but not always, subsequently invoked from the current function. All needed functions can be selected. Fast access to related display functions is achieved via the Fast Links capability. Fast Links allow users to quickly switch between related data with tab-page-like efficency. For example, a user may wish to see a summary of a case then jump to all the parties involved, view images of scanned documents, and view the next scheduled court proceeding for that case.